World's only PNEUMATICALLY operated nitrous/fuel valve. Available with revolutionary built-in Distribution Block, or with 1/8" NPT Bottom Outlet. Solenoid valves on a typical 3 system Nitrous Set-Up (6 fuel / 6 nitrous) would weigh over 10lbs. & require over 60 amps. A combo-Flo™ System would weigh 2 lbs. & use 1/2 amp per system. The clutter of twenty-four electrical wires is eliminated, and replaced with 6 small, easy-to-detach push lock connections. Air Operated - no solenoid, no electricity, no hassles. 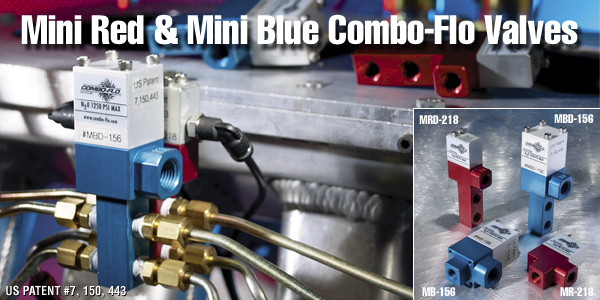 A Combo-Flo™ valve for every nitrous application "wet" or "dry". The Combo-Flo™ system can operate on any existing CO2 or other suitable pressure supply. Eliminate delay box problems due to high amp draw by conventional solenoids. Combo-Flo™ valves can be left open for a long duration unlike conventional solenoids which can only be operated for a few seconds before being damaged by heat. w / 5/8" SQ. Distribution BLK.